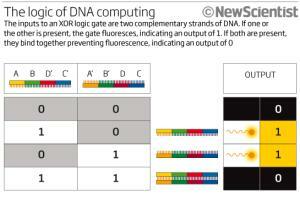 DNA-based logic gates that could carry out calculations inside the body have been constructed for the first time. The work brings the prospect of injectable biocomputers programmed to target diseases as they arise. "The biocomputer would sense biomarkers and immediately react by releasing counter-agents for the disease," says Itamar Willner of the Hebrew University of Jerusalem, Israel, who led the work. The new logic gates are formed from short strands of DNA and their complementary strands, which in conjunction with some simple molecular machinery mimic their electronic equivalent. Two strands act as the input: each represents a 1 when present or a 0 when absent. The response to their presence or absence represents the output, which can also be a 1 or 0.